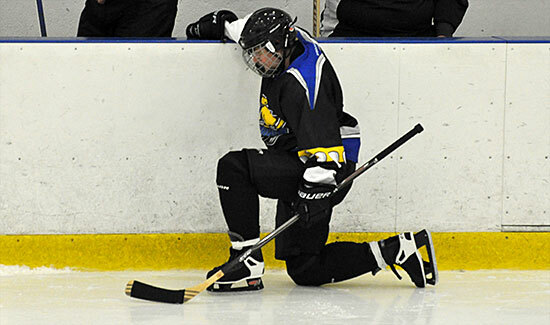 Unidentified hockey player protests fatigue, or possibly an injury by taking a knee as Ruination tops Black Ops 6-3 Monday night. Other players voiced approval and added that they will often add “hunching over on the bench,” “heaving for air,” and sometimes “throwing up” as part of their politically-charged fight against fatigue. Goaltender Robert Delorey was seen taking a knee, which he claimed was to “stop the puck.” Officials did not see it that way and awarded a goal to the Ops. Some players in an attempt to avoid controversy, simply leaned on their sticks between plays or else were spotted skating at what is often called “half speed” to protest fatigue.